Abstract: Tensorflow 2.0 makes Keras the default API for model definition. This is a big change. It makes Tensorflow more accessible to beginners and newcomers and it also disrupts consolidated patterns and habits for experienced Tensorflow programmers. This workshop is aimed to both audiences and it covers how to define models in Tensorflow 2.0 using the tf.keras API. It also covers the commonalities and differences between the open source Keras package and tf.keras, explaining pros and cons of each of the two. If you are getting started with Tensorflow or you're puzzled by the changes in Tensorflow 2.0, come and learn how easy it is to design models using Keras. Bio: Francesco Mosconi. Ph.D. in Physics and CEO & Chief Data Scientist at Catalit Data Science. 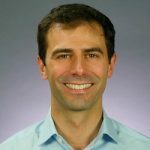 With Catalit Francesco helps Fortune 500 companies to up-skill in Machine Learning and Deep Learning through intensive training programs and strategic advisory. Author of the Zero to Deep Learning book and bootcamp, he is also an instructor at Udemy and Cloud Academy. Formerly co-founder and Chief Data Officer at Spire, a YC-backed company that invented the first consumer wearable device capable of continuously tracking respiration and physical activity. Machine Learning and python expert. Also served as Data Science lead instructor at General Assembly and The Data incubator.